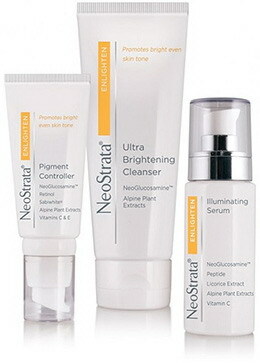 The Enlighten Trio has been created by NeoStrata specifically to promote bright, even skin tone. With NeoGlucosamine and Alpine Plant Extracts. With NeoGlucosamine, Peptide, Licorice Extract, Alpine Plant Extracts and Vitamin C.
From NeoStrata with NeoGlucosamine, Retinol, SabiWhite, Alpine Plant Extracts and Vitamins C & E.